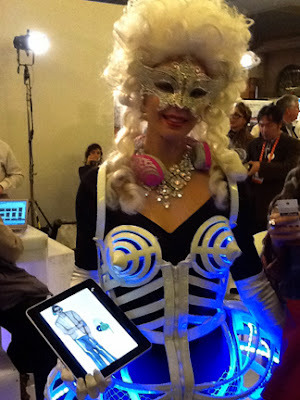 Last year's FashionWare event at International CES 2013 was a patchwork quilt of surprises. From ready-to-wear clothing and accessory styles now in stores to experimental prototypes and some sparkling one-offs, the fashion meets tech interpretations were eye catching and noteworthy. 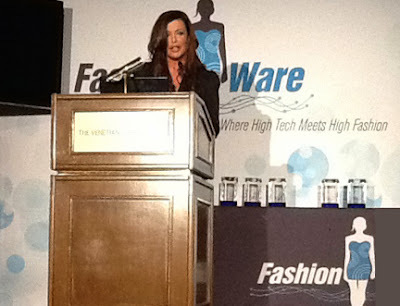 The 2013 FashionWare show in Las Vegas was produced by Robin Raskin, founder of Living in Digital Times. Actually, I've admired Robin for many years since I too am a Baby Boomer who has been attending CES for decades and am still mesmerized by how technology continues to permeate more and more of modern every day life. Hostess and actress Kelly LeBrock, known for both her glamorous and techie roles in movies like Woman in Red and Weird Science, couldn't have been a better choice to comment as models walked the runway in their high tech fashion best. My favorite ensemble at this fashion-merging-with-tech show was the playful outfit featuring a light up dress trimmed with children's LED powered building blocks blinking in four different colors. 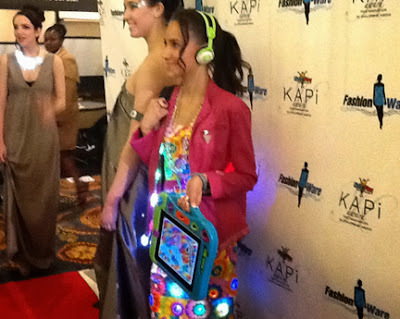 Completing the multi hue look were brightly colored accessories that included KidzGear headphones, a GeoPalz pedometer and the ARTSEE Studio which is a kids' no-mess creative art workstation that works with the iPad. Among other 2013 designs were at least one outlandish one-off and an extraordinary collection of MOON Berlin’s dreamy and elegant LED evening and party dresses. A grouping of stylish casual separates integrating Alphyn’s custom pockets for both women and men to stow their multitude of gadgets and devices was also pretty cool. 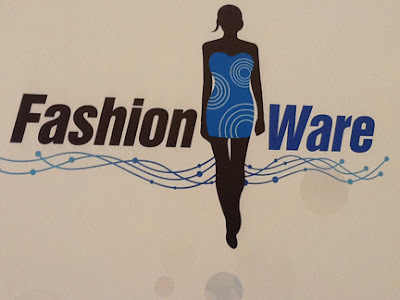 For more details from last year's runway show don't miss the FashionWare CES 2013 Look Book. Wondering what's to be shown at the FashionWare live show at CES 2014 next week? Here's a sneak peek at the fashion designers to be spotlighted. 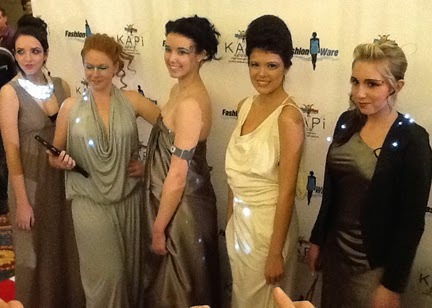 FTC Disclosure: As a credentialed member of the media, I attended International CES 2013 and the FashionWare cocktail party and runway fashion show. I will be attending both CES and FashionWare as press again this year. However I did not receive payment or any other compensation associated with this post. See complete FTC Disclosure information that appears at the bottom of MommyBlogExpert's main page and at the bottom of every individual post on this blog, including this one.